Last week the “biggest show in snow” drew large crowds with a great deal of those attendees visiting the Pro-Tech booth. The annual Snow and Ice Management Association’s Snow & Ice Symposium was held this year in Cleveland, OH at the Huntington Convention Center. Each year the event draws snow and ice professionals from all over North America, offering them a wide variety of educational sessions and networking events. The highlight of this year’s show was the trade show, which had the highest number of exhibitors in show history. The Pro-Tech booth was very busy; attracting people who were interested in seeing the company’s latest addition to their product lineup: The Fusion Edge Sno Pusher. This new containment snowplow features a patent pending cutting edge, floating coupler, and wear shoe design that are meant to significantly improve surface clearance and ease of use for customers. The Fusion Edge Sno Pusher on display was presented on a raised platform with several stations that showcased the plow’s most interesting features. Another product of interest at the show was one of the first Sno Pushers ever built. The snow pusher on display was a 16′ Rubber Edge Sno Pusher that has been in use for 25 years. 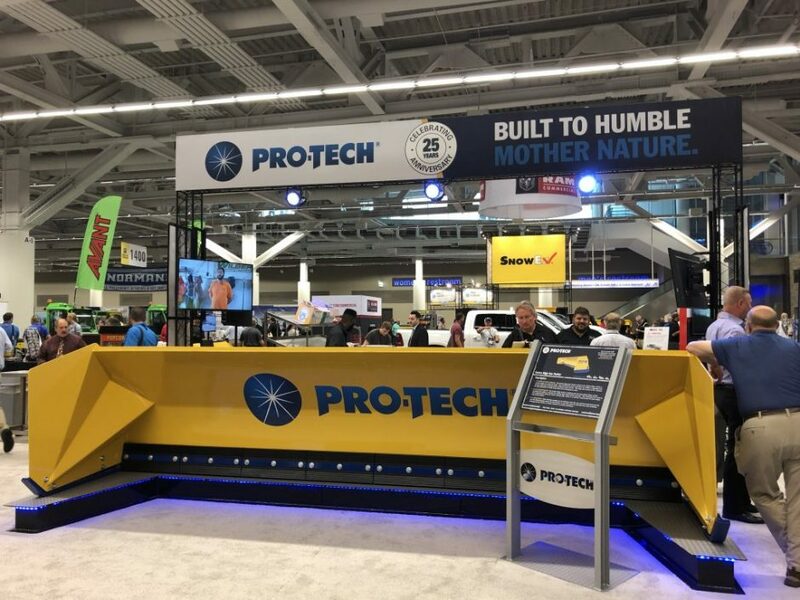 Owned by Rochester, NY company, Seneca Roadways, the company was kind enough and excited to loan the plow to Pro-Tech for the show. In addition to Fusion Edge Sno Pusher and “original” Rubber Edge Sno Pusher, Pro-Tech also displayed an 8′ Sno Blade skidsteer snowplow and their most current version of the Rubber Edge Sno Pusher. Pro-Tech dealer Ohio CAT provided the skidsteer that was attached to the Sno Blade. One of the highlights of the show outside the exhibitor booth was Pro-Tech’s “pin promotion” for the Fusion Edge Sno Pusher. This promotion started with every attending receiving a pin and information postcard. If attendees wore the pin during the show at any event they could be randomly selected by Pro-Tech to receive cash up to $100. The promotion was a huge success and a great deal of fun for participants and the Pro-Tech staff. The management and employees at Pro-Tech would like to thank everyone that came to the show, visited our booth, and expressed an interest in our products. Thank you to the Snow and Ice Management Association for putting on such a great show. We will see you next year in Michigan!